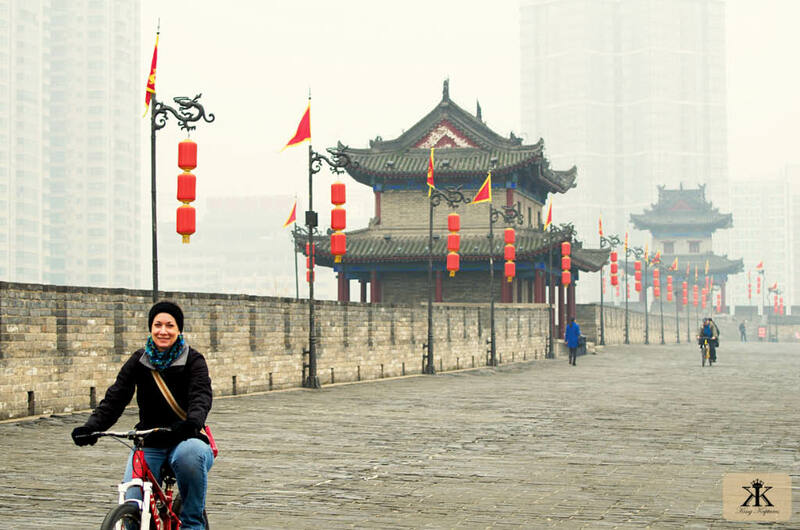 “So is this fog, smog, or just outright pollution,” I asked our guide Jessie in Xi’an, China. “Yes,” he responded, smiling knowingly yet uncommitted. 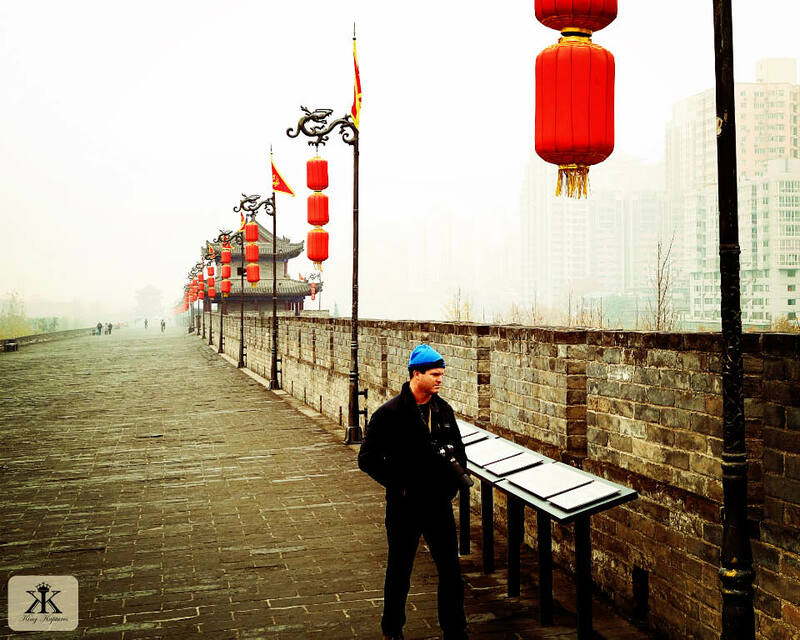 The thick blanket of haze’s assault on our senses that windless morning initially obscured the majesty of Xian, as well as the sun. 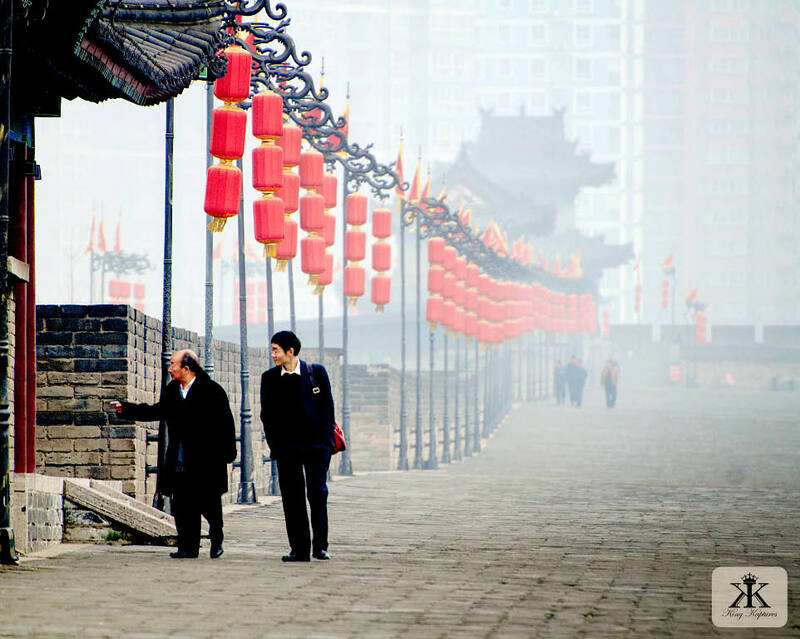 The pollution in urbanized China is at once offensive and inescapable. I will literally never complain about our Environmental Protection Agency ever again; clean air and water are worth the cost and bureaucratic oversight. 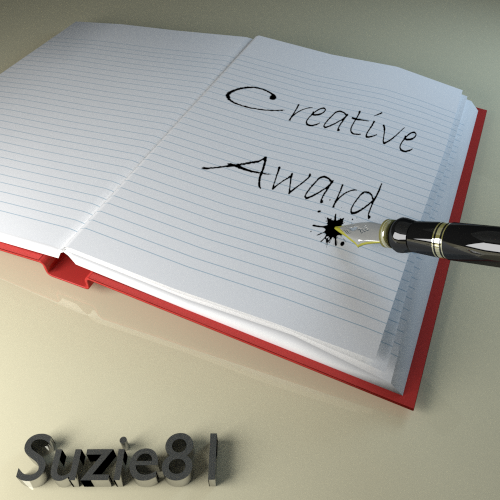 It was that bad there…. 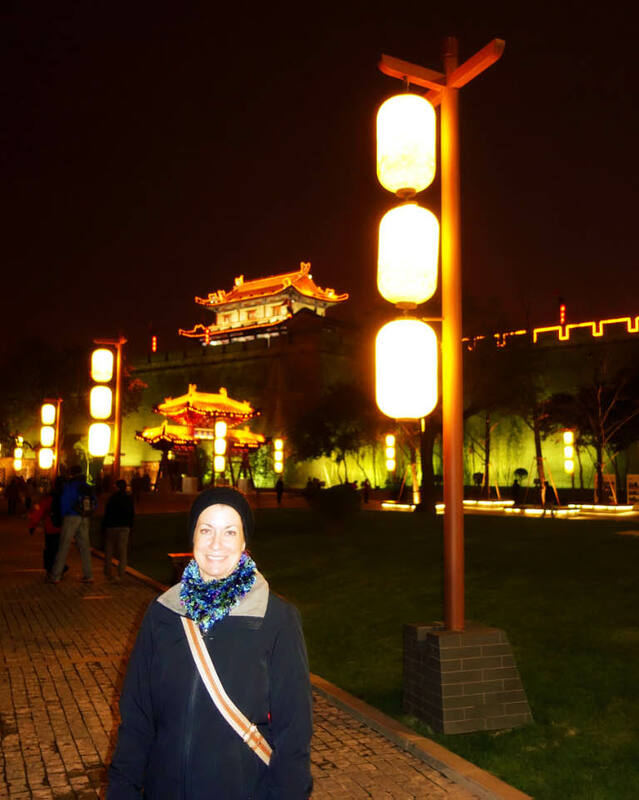 Although Xi’an is probably best known for the relatively recently discovered “Terracotta Army” on its outskirts, in my opinion it is the restored and refurbished ancient city wall and its surrounding City Park that are the premier attraction there. 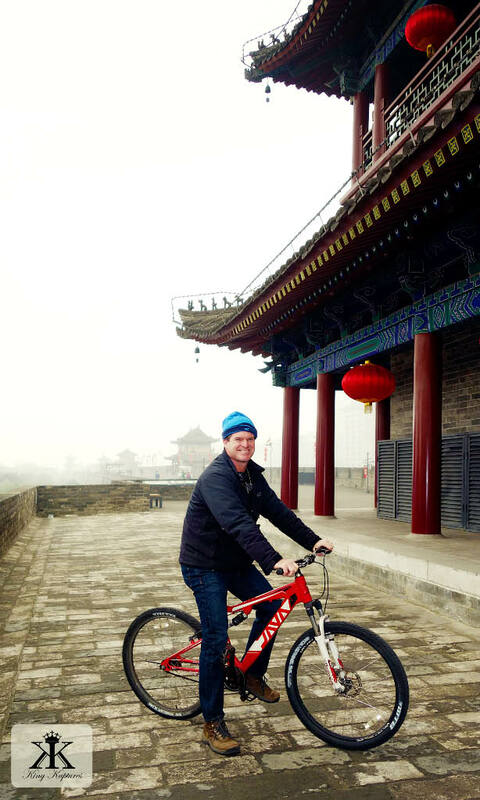 Riding on a modern mountain bike over cobblestone roadway that’s hundreds and hundreds of years old, thoughts of what the wall has withstood cycled through my mind: war, famine, disease, earthquakes, political upheaval and the very rise and fall of numerous dynasties. Yet today, when you examine the wall’s surrounds, you realize that on both sides – inside and out – lies urbanization not too different from any other city that you’d see in Europe or America. The hustle and bustle of a city full of cars and commerce, and throngs of people rushing about in the chaos of their day. Of lovers and tourists walking hand-in-hand and camera-in-hand. And of tall apartment towers and swank condo buildings, but also of quiet residential areas and timeless temples of ages old. 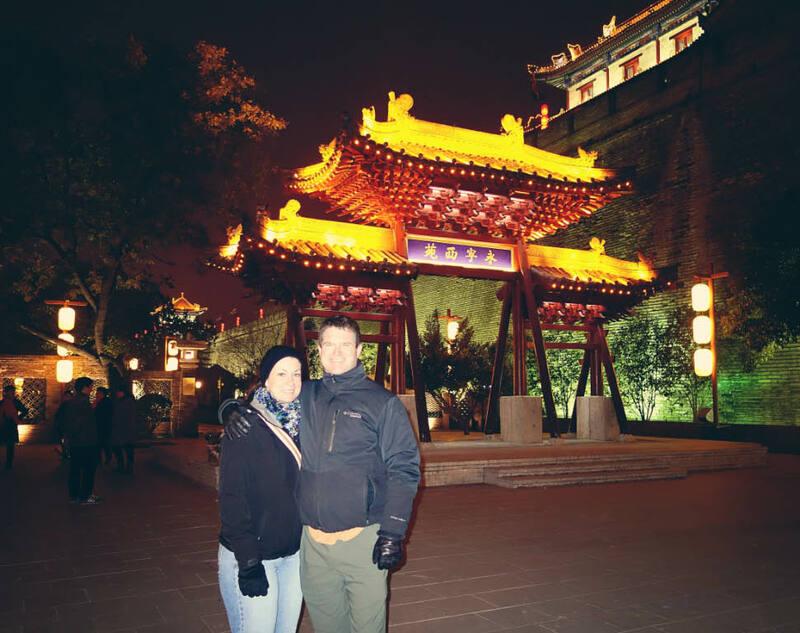 The fortifications of Xi’an (西安城墙), an ancient capital of China, represent one of the oldest and best preserved Chinese city walls, and one of the only centuries-old, large-scale complete walls left in the world. Construction of the first city wall there began in 194 BCE, and enclosed a large area of roughly 14 square miles. 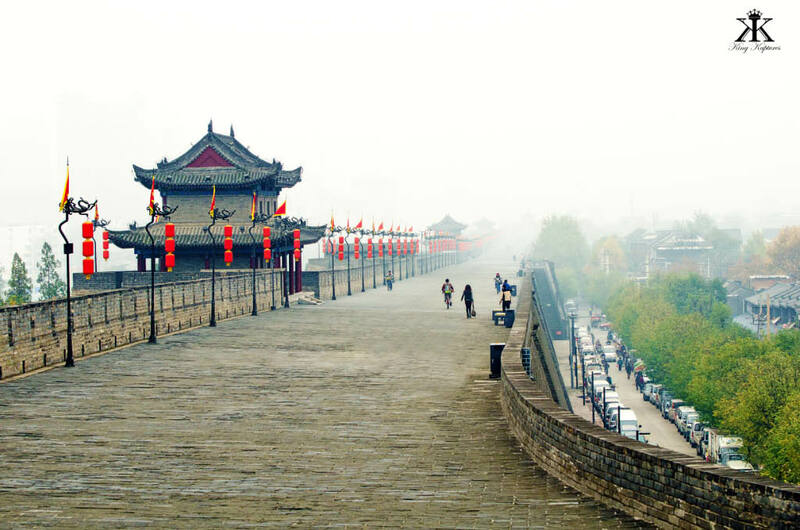 Although parts of the wall today date back to the 7th century Tang Dynasty, what we see today was started by the Ming Dynasty in 1370, and encircles a much smaller city area of just over 5 square miles. The wall measures about 8.5 miles in total length, averages about 39 feet in height, and between 49-59 feet in thickness at its base. It remains one of the largest ancient military defenses in the world. 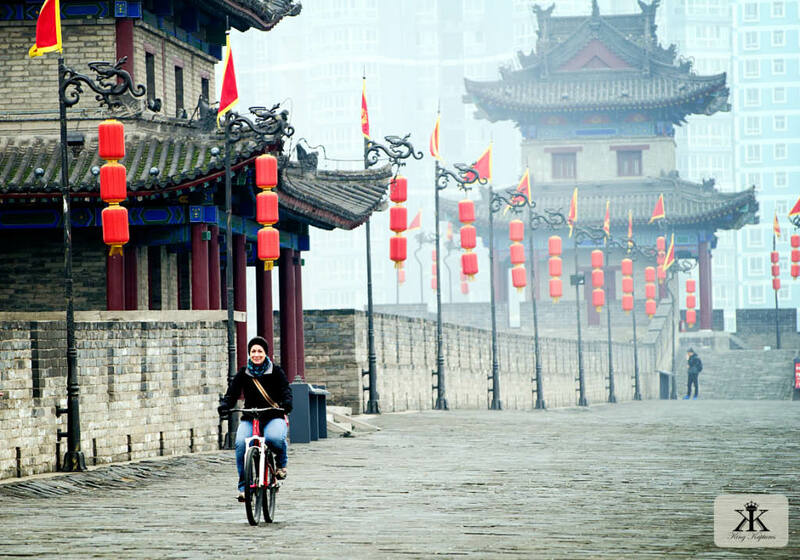 Even after China’s capital was relocated, the city remained an important military stronghold until contemporary times. 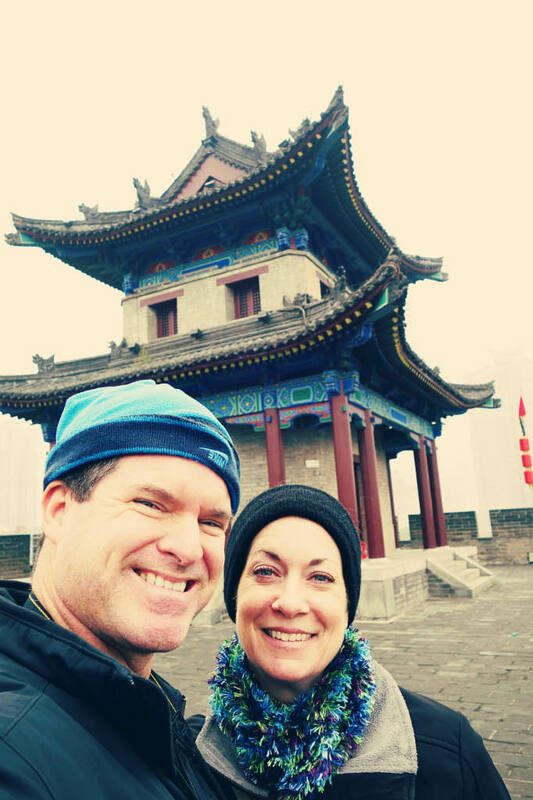 Just like the Great Wall attempting to encircle the entire country (see Heroes of the Great Wall for our adventures on that fortification), the Xi’an City Wall was originally built for defense, with watchtowers, a deep moat and drawbridges. Every 120 meters or so there is a watchtower and rampart which extends out from the main wall, 98 in total. Each is designed with a sentry building to provide a sector defense from which soldiers could protect the city without exposing themselves to hostile forces. The distance between towers is critical; it is just about twice the distance of arrow flight back in the day of the wall, allowing soldiers from consecutive towers to completely cover the wall. On the outer side of the wall there are almost 6,000 crenellations, small holes from which troops could fire while remaining protected behind the cover of the wall. On the inner side, parapets provide fall protection. Corner ramparts and watch towers, higher and larger than the others, are located on each of the wall’s four corners due to their strategic importance in defending the salients of the fortification. Weapons 500 years ago lacked the power to break through such a wall. The only way to take such a fortified city was by attacking and entering through a wall gate. 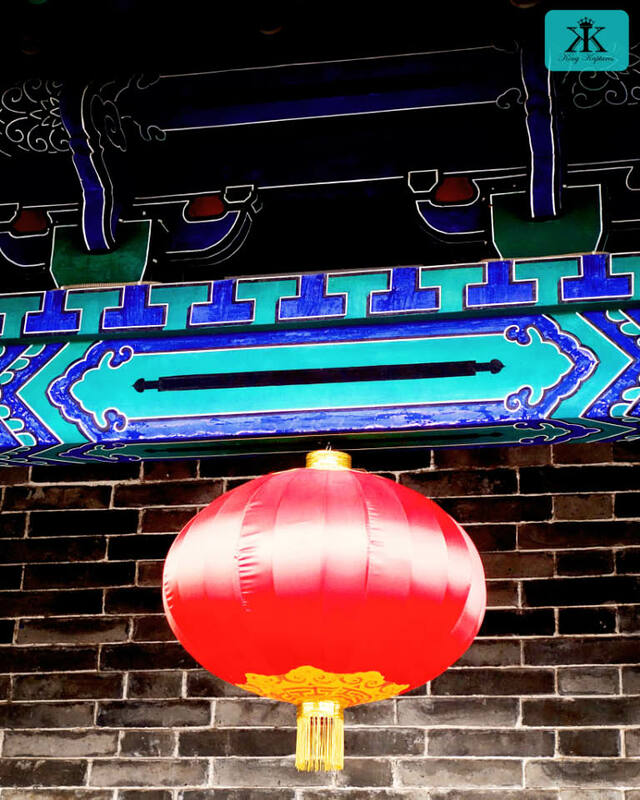 At Xian, the city wall includes four main gates: Changle (“eternal joy”) in the east, Anding (“harmony peace”) in the west, Yongning (“eternal peace”) in the south, and Anyuan (“forever harmony”) in the north. 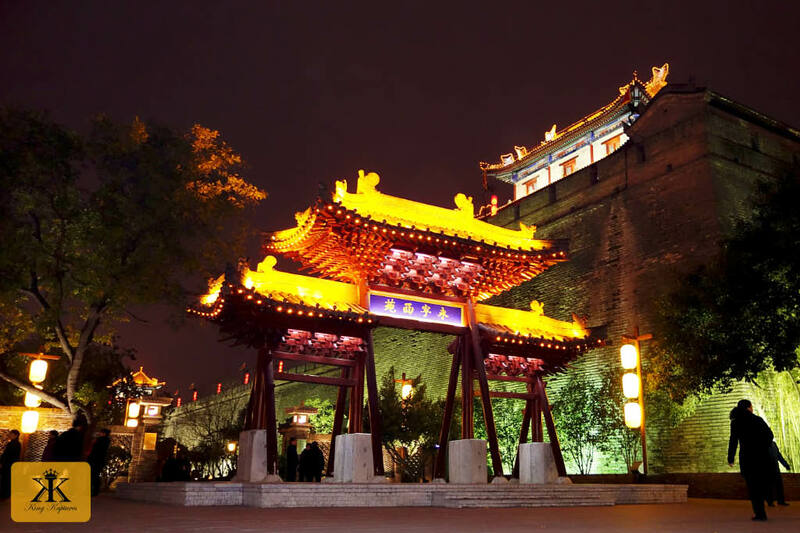 Each city gate has three gate towers called Zhenglou, Jianlou and Zhalou. The outer most is Zhalou, used to raise and lower drawbridges that would span the moat. 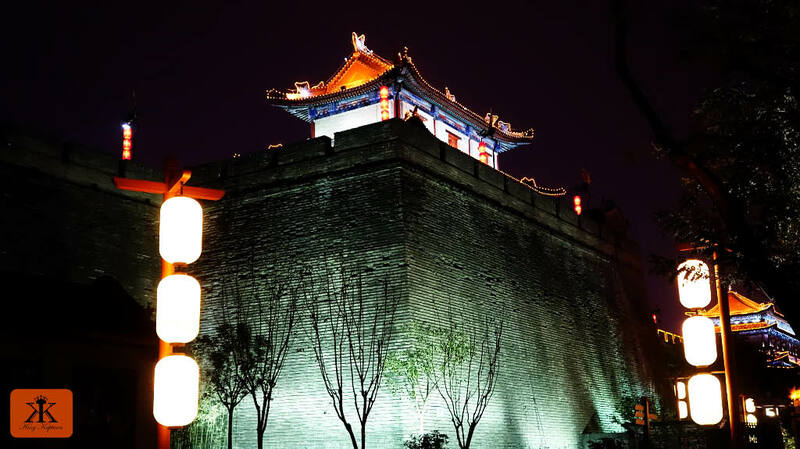 Jianlou is next and serves as a robust defensive outpost of the wall with many windows for firing arrows. 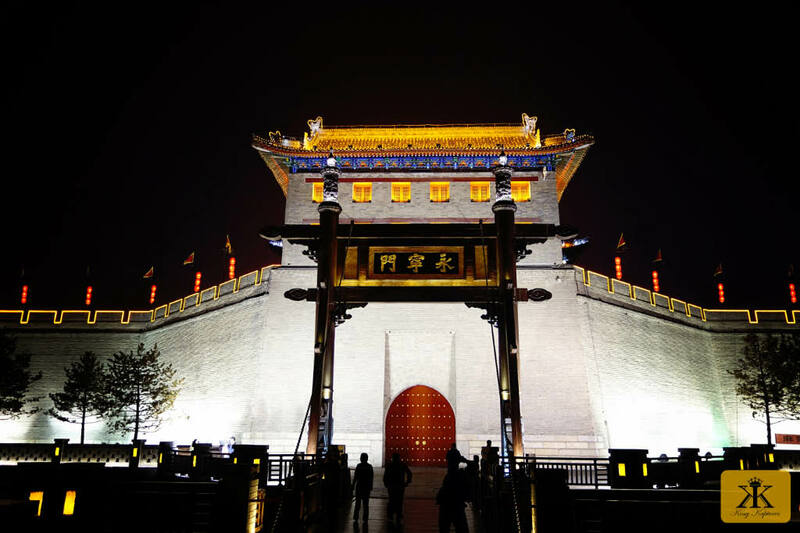 Zhenglou is the inner and most massive tower, and serves as main entrances to the city at each gate. 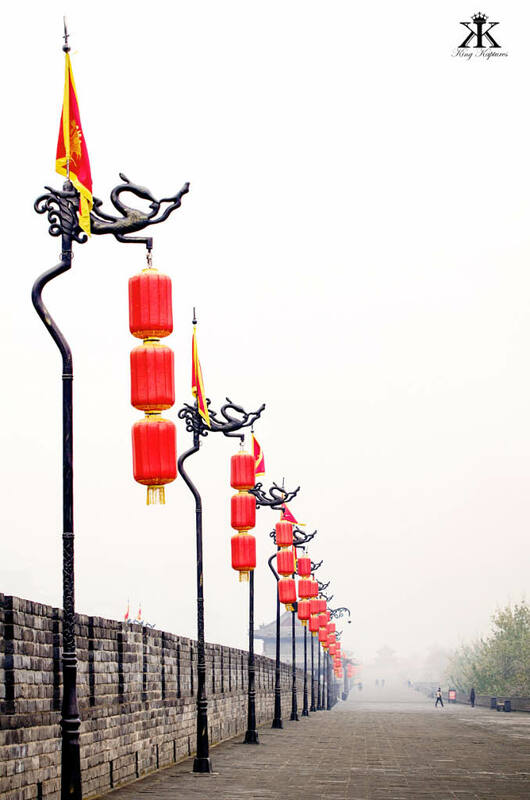 The south gate, Yongning, is the most beautifully finished and the site of important greeting ceremonies and other traditional pomp and circumstance. It was also the only gate used when armies returned victoriously from their expeditions afar. The South Gate Square was only recently improved and opened in the fall of 2014. 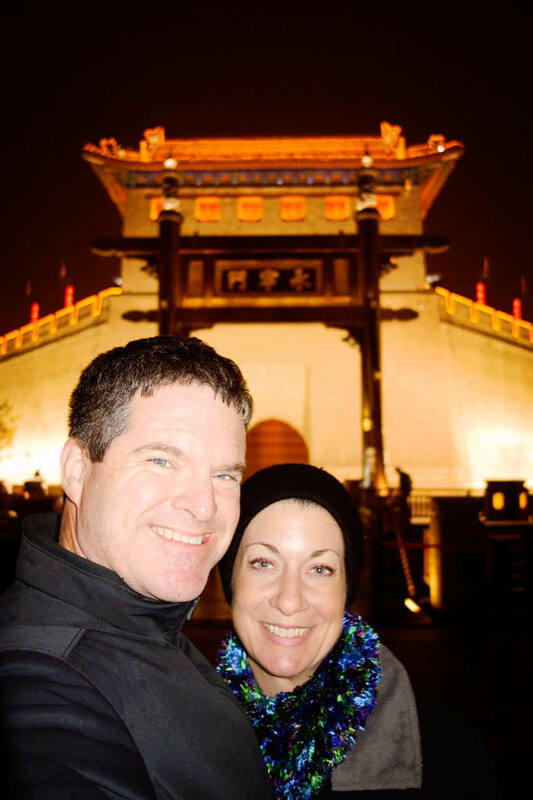 Our hotel was located immediately adjacent to the gate’s square and City Park grounds, and we enjoyed beautiful evening views from our hotel bar on the 10th floor as the entire city wall is trimmed with gold lights and illuminated red Chinese lanterns in a perfect a mix of grandeur and elegance. There are regularly scheduled shows and performances held here, from warrior parades to orchestra recitals. Viewing of these performances is included in your ticket fee. We, unfortunately, didn’t have the time available to enjoy any of these short but powerful 10-15 minute acts. The City Wall has been rebuilt three times: in 1568 with bricks, in 1781 with today’s gate towers, and restored more recently in the 1980s. The impressive City Wall Park has been built between the high wall and deep moat. 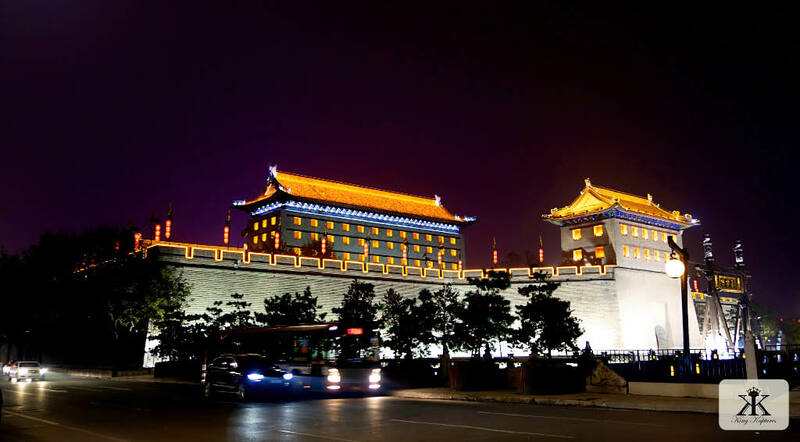 Beautifully landscaped and well-appointed with classical Chinese architecture accents the majesty of the wall, a stroll through the park is a must, both in the day and at night. 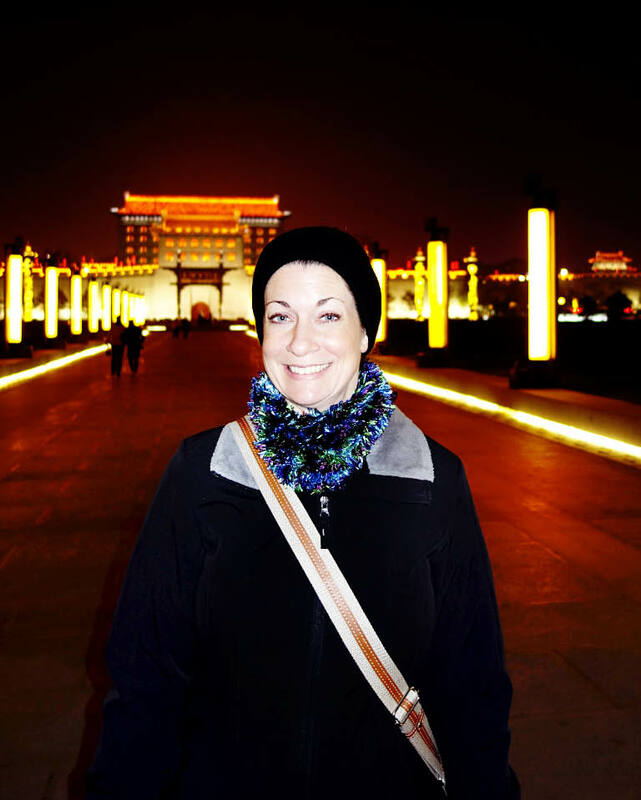 The park has become a favorite spot for locals, and we enjoyed seeing the elderly doing their traditional Chinese exercises and meditation early in the morning, and then groups of people spontaneously dancing in the evening in what can only be described as some sort of folk-based jazzercise! Couples here walk hand-in-hand, and street vendors sell snacks and sweets at night, while the area is bordered with high-end cafes, coffee shops and tea houses open during the day. 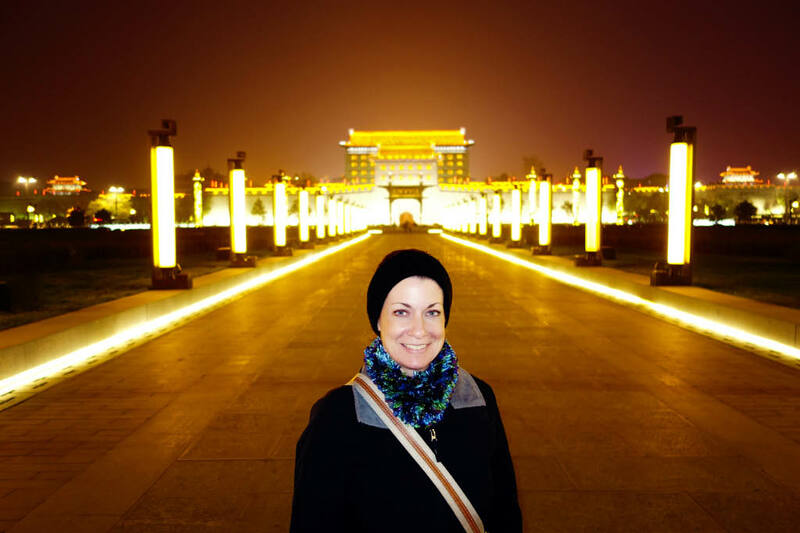 This park is really a great place to see the nature of local life in today’s Xi’an. 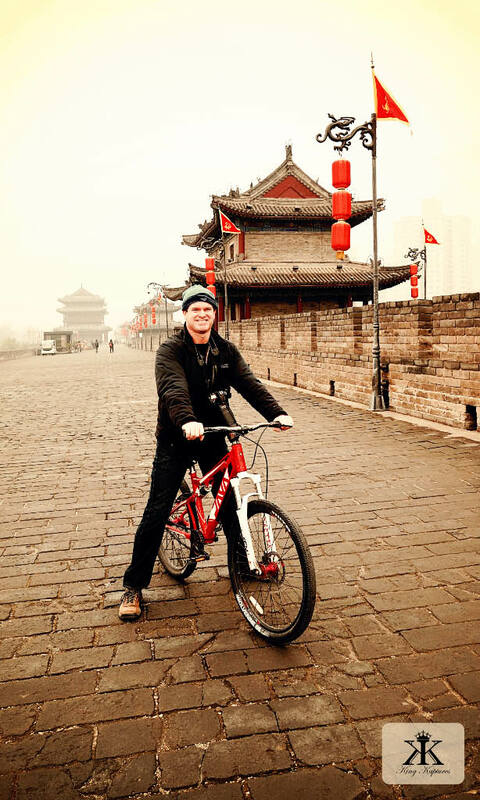 One of the best ways to experience the wall is by bicycle. 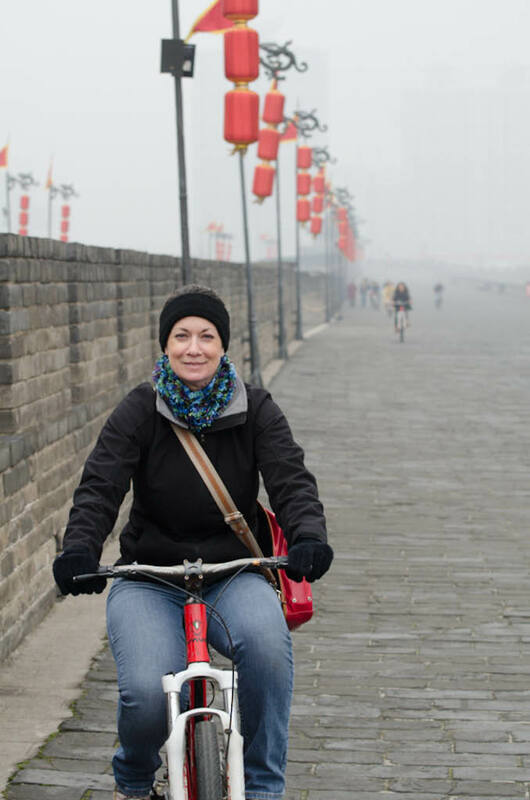 Bicycles can be found for rent at the main gates, and perhaps is the most popular way to take in the entire length of this fortification, which takes 1½ to 2 hours at a reasonable pace (we double such guidelines since we stop and take photos so often). A cash deposit is required to rent a bike, and rentals are for 100 minutes, although you can ride longer by paying more for each additional 10 minutes spent riding. Both single and tandem rides are available to rent. Bicycles should be returned at the South Gate before 20:00; the other gate rental sites close at 1800. 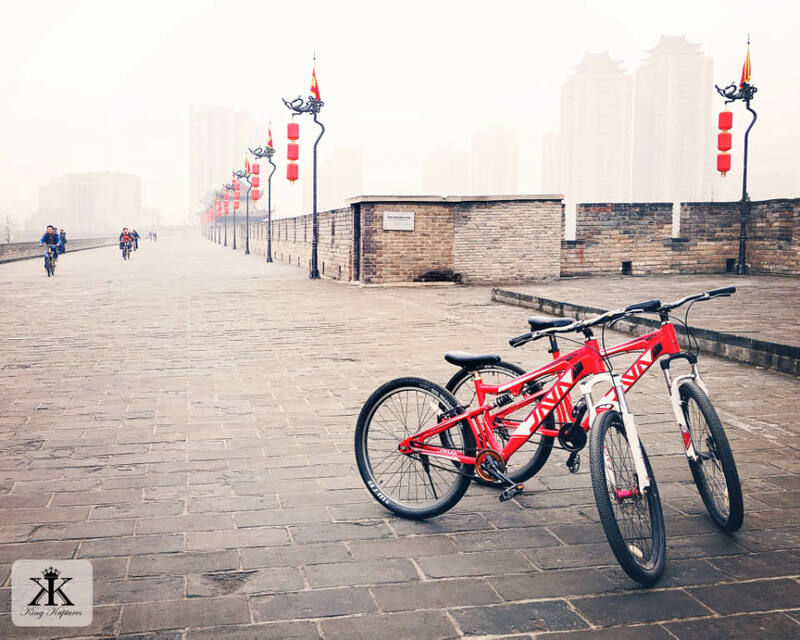 While you will be cycling on relatively flat ground, as a centuries-old structure built without the assistance of modern equipment, the ride can get quite bumpy where the wall’s cobblestone surface is somewhat uneven. The wall also has a changing pitch depending on your location, although this is hardly noticeable. If you do have issues providing your own power or have small children in tow, wall sightseeing is also available by electric golf cart. The Wall can be ascended from any of the gates, and once on the wall you can tour the whole rectangle it forms. Here is a hiking itinerary around the wall starting from the South Gate as a basic reference. 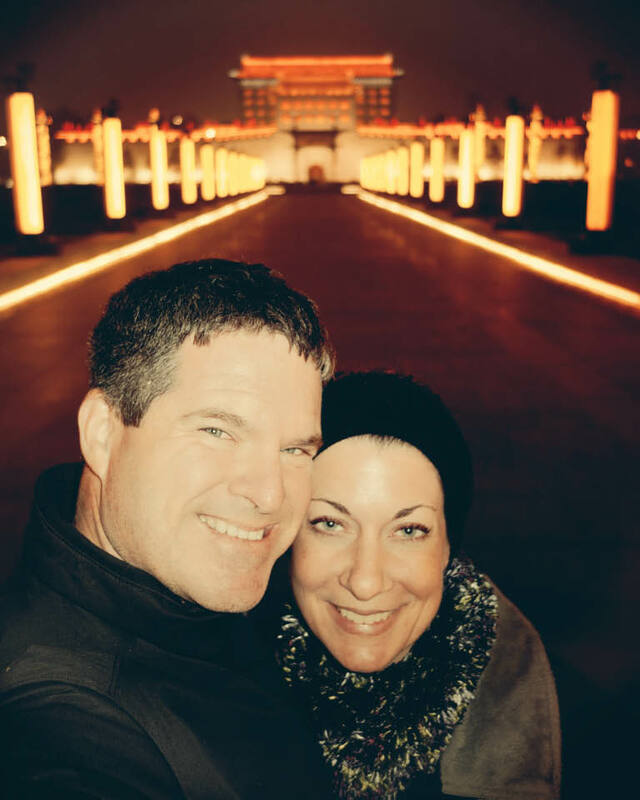 After visiting the wall by day and at night, and while enjoying an almost private bicycle ride with Jody along its wide elevated avenue, I was struck by how this fortification, designed and built as a physical barrier to obstruct those wishing the city harm, now serves as a symbolic connection between not just China’s past and present, but between the historically isolated China and the outside world. 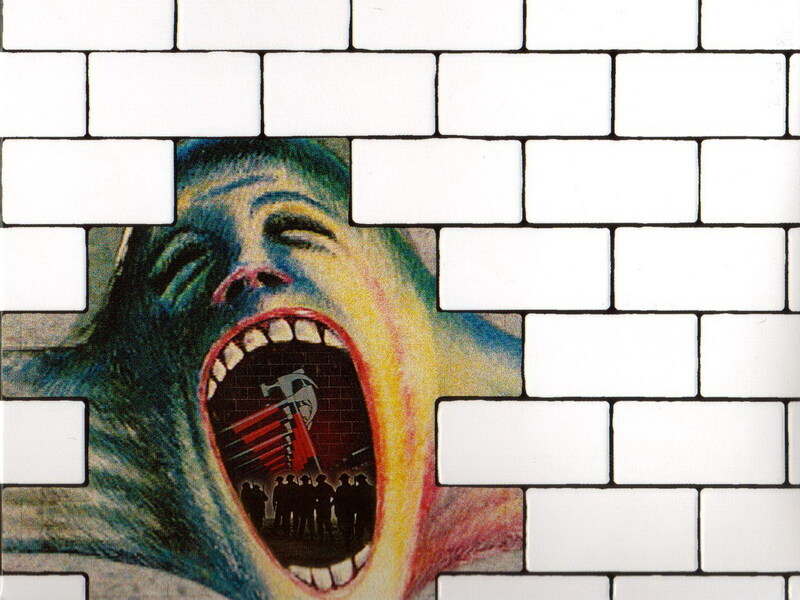 While this blog’s opening lyrics by Pink Floyd concern more personal struggles with intangible metaphorical walls, the moral of their rock-opera no less applies: though there will always be personal and social barriers erected out of fear, oppression, pain, and isolation, it’s the job of every socially conscious individual and community to never rest in their efforts to tear down the walls that separate us. 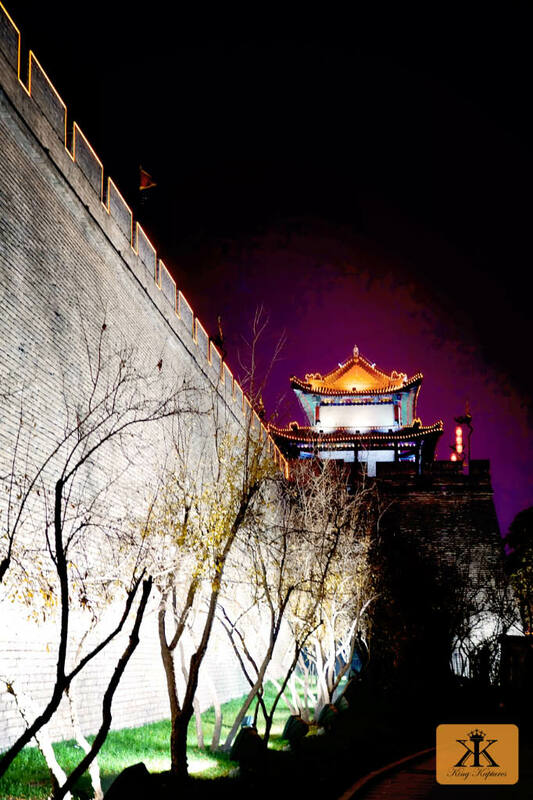 Visit the City Wall at Xi’an. Although still a physically imposing barricade, you’ll find that it now does more to bind us together…than split us apart as it historically has done.